This is something I have personally struggled with so I’ll discuss some of the things that have worked for me. Your first instinct may be to analyze what you had before that you don’t now and what changed, but I’d suggest focusing instead on the present and what will work best for you right now at this point in your life. There are lots of things I was motivated to do a few years ago that I no longer care about. Having said that, working out is one thing that’s important enough that you won’t want to just let it fall out of your life. I believe you need to make an effort to exercise regularly and that it probably isn’t as painful as you think. First, the more you rely on motivation, the less consistent you will be. Instead of asking how to motivate yourself, the better question would be how to remove motivation from the equation. Whenever you’re faced with something you don’t enjoy doing, lack of motivation will always be a barrier. 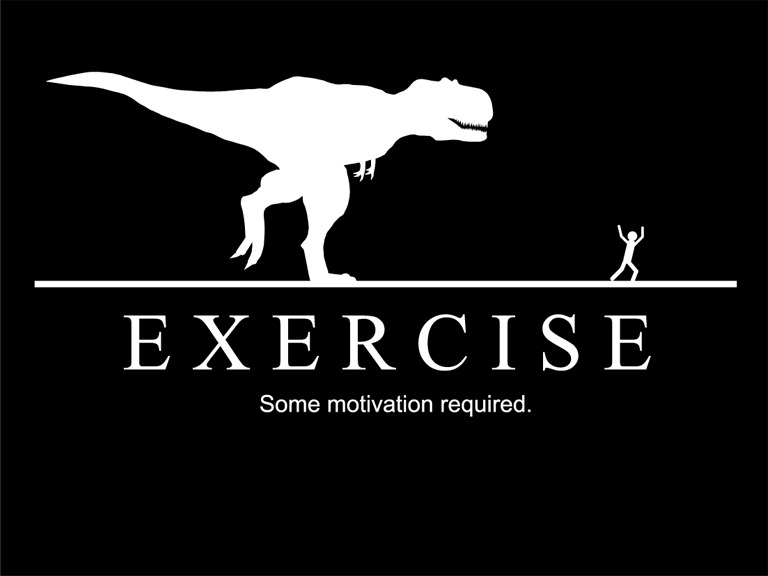 Unless… you don’t need motivation. Look at the things you do without fail, like brushing your teeth or going to work. Brushing your teeth is a tiny habit that has been ingrained in you through decades of repetition. You can do the same thing with working out, but you need to set the bar as low as possible to begin. Set an embarrassingly low goal. Leo Babauta of zenhabits suggests flossing only one tooth to develop a flossing habit. This sounds absurd, but that’s the point. It’s so easy, you can’t say no. Instead of trying to work out for an hour a day, set a goal to work out for five minutes a day or do one set per day. This is how I’ve been able to get myself to train almost daily. My strength training goal is three sets per day and this usually takes me no more than five to seven minutes. Remove all barriers that might prevent you from achieving your tiny goal. For example, I work out at home, so that I don’t have to worry about getting dressed and going to a gym. I also schedule my workout at lunch time because after a lot of testing, I’ve found this is the time of day when I’m least likely to skip. First thing in the morning, my energy is too low and later in the evening, I don’t feel like doing anything. So, I just knock out my three sets at lunch time. Then, I can go about the rest of my day. If you think to yourself, “This will be over in five minutes,” then you can do almost anything. On a side note, you might think that working out for five minutes is meaningless, but the truth is you can get stronger over time with a short, focused effort every day. I’ve improved on all my lifts by 20-30 pounds over the last few months just by consistently showing up, knowing what I’m going to do, and executing on it. Which brings me to my next point: add an element of progression. When you add an element of progression, even a tiny one, you “gamify” your workouts and that gives you a much needed push. Humans naturally want to improve. This is why video games are so addictive. Once you beat a level, you can graduate to the next level. If you construct your workouts like this, then they will be much more fulfilling than just doing the same thing every day. If you're interested in "leveling up" your workouts, I suggest checking out Nerd Fitness. As I mentioned, my goal is three sets per day, reverse pyramid style. Once I get to 6, 7, and 8 reps for my current weight “level,” then I move myself up to the next level. For example, on weighted chin-ups, my current level is 40 pounds for set 1, 30 pounds for set 2, and 20 pounds for set 3. Once I get to 40x6, 30x7, and 20x8, then I’ll move up to 45 pounds, 35 pounds, and 25 pounds. I’m always trying to beat what I did last week, even if it’s just by one rep TOTAL. So if last week, I did 40x5, 30x6, and 20x7 and this week, I did 40x6, 30x6, and 20x7, I still consider that a win. Again, it doesn’t seem like much, but considering I couldn’t even do a single weighted chin-up a few years ago, it’s definitely progress. With the gamification, I still don’t look forward to my workouts, per se, but I do get much more satisfaction from them. If the solo progression thing isn’t for you, you can also create some sort of friendly competition. Fitbits are very popular these days and I am often invited to take part in their daily step challenges. Simply not wanting to lose to a friend can be just enough to get you off the couch and walking around your block. Now, let’s look at the other habit I mentioned: going to work. Most of us go to work not because we love it or because we are motivated to go every day. It’s because there is a very large negative consequence if we don’t go. Not showing up could mean getting fired which means no money to support yourself and your family. Make no mistake about it. For the majority of people, THIS is the real reason why they go to work. Now, how can you apply this same sense of urgency to working out? You can create some sort of financial consequence for not working out. Today, there are apps like DietBet or Pact that help you keep health and fitness commitments to yourself by giving you a financial incentive. I have personally never done one of these because I don’t want to rely on paying money into a pot to do something like working out. My ultimate goal is to build an exercise habit that is as fail proof as brushing my teeth and will last my entire life. My final tip to avoid the motivational struggle is to simply do something that you enjoy. I had to construct a small daily work out habit for strength training because it’s not something I really enjoy doing, but it is something that’s extremely important, especially as I get older. However, I really enjoy playing soccer and walking. So for my cardio, instead of forcing myself to go for runs, I simply play soccer and go for a walk a few times a week. It always amazes me how many people think that in order to “be healthy,” they need to run a few times a week or eliminate all carbs from their diet, even if these things make them miserable. There’s always more than one way to achieve a goal. So if your goal is to just exercise regularly, find something you love whether it’s golf, rock climbing, or yoga.